The dental industry has experienced the same rapid advancements in technology as we have seen in most every other industry. We are lucky enough that local Fort Myers dentist, Scott Trettenero, DDS has invested into much of these advancements. The wonderful thing about dental tech is the advancement in the quality of the dental products and the care we receive. The leaps in dental tech have improved waiting times and the comfort patients experience from the chair. The days of a painful dental experience is all but gone with painless injections and lasers that mostly eliminate cutting and bleeding. The Dental Office of Scott Trettenero, DDS is filled with the latest and the greatest in dental advancements. Competing Fort Myers dentists are just now getting into technology that Scott Trettenero, DDS has been using for over a decade. If it is out there, you can bet Dr. Trettenero knows about it, or probably has it in his dental clinic. This page titled “Dental Technology” covers some of the game-changers that you will find in The Dental Office of Scott Trettenero, DDS. Even if you are not tech savvy, you still will find these technical devices fascinating. This handheld high definition digital scanner allows Dr Trettenero to take incredibly precise images of the teeth instead of using traditional molds that required patients to sit for as long as four minutes with trays filled with messy, unpleasant tasting material in their mouths. These 3D impressions will then be used to create crowns, bridges, veneers or related restorative products. The precision of this scanner cannot even be compared to anything that precedes this technology. The device features a wand-shaped scanner. On the dime-sized tip are multiple lenses that capture a 3-D video with millions of bits of information about the patient’s teeth and bite. The images are flashed immediately to a chairside monitor so we can make sure we have captured a perfect picture. The images then are e-mailed to a lab where technicians use the computer images to build a precise and beautiful looking restoration. CEREC is a complete restorative system that allows us to create beautiful, all ceramic restorations in just one visit. 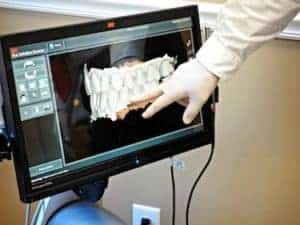 Using 3D imaging, your restoration is created on the computer screen and then it is cut out of a block of industrialized strength ceramic with our high speed milling machine. Not only does this procedure save you time and inconvenience, it also means that you don’t have to wear temporaries and come back for another appointment to have them removed. Cerec enables us to restore teeth with some of dentistry’s finest materials. Our ceramics are some of the most attractive and durable available. 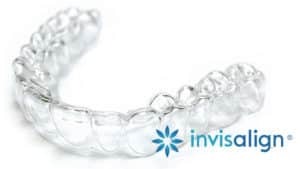 Invisalign ® takes a modern approach to straightening teeth, using a custom-made series of aligners created for you and only you. These aligner trays are made of smooth, comfortable and virtually invisible plastic that you wear over your teeth. Wearing the aligners will gradually and gently shift your teeth into place, based on the exact movements Dr Trettenero plans out for you. There are no metal brackets to attach and no wires to tighten. You just pop in a new set of Invisalign braces approximately every two weeks, until your treatment is complete. You’ll achieve a great smile with little interference in your daily life. The best part about the whole process is that most people won’t even know you’re straightening your teeth. Dr. Scott Trettenero, DDS is one of the handful of dentists in Southwest Florida that offer this revolutionary technology. With the PerioLase laser there is no painful cutting or suturing. Traditional periodontal therapy needed to perform surgery in order to treat gum disease, which lead to great discomfort and a long healing process. 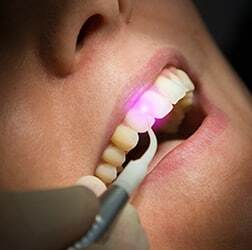 Now the FDA has approved LANAP (Laser Assisted New Attachment Procedure) for the treatment of gum disease. The PerioLase laser takes away the pain, sutures, and surgery that used to be necessary to treat gum disease. It is truly one of the miracles of modern dentistry. Only the PerioLase laser is capable of performing LANAP.